Each event just keeps getting bigger and we’re stacking the deck on this one! 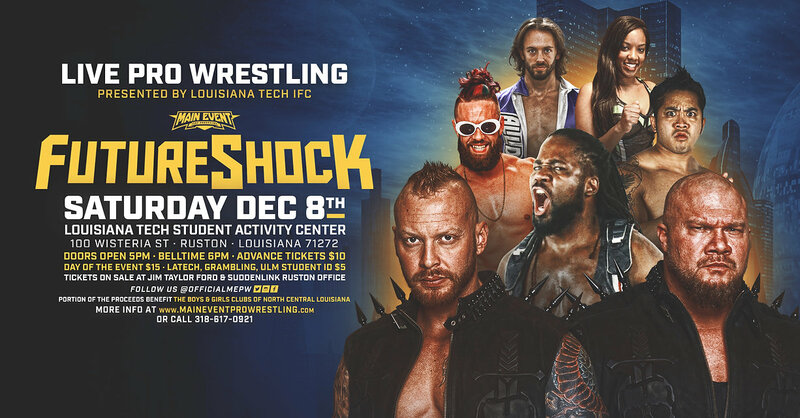 #FUTURESHOCK is LIVE from Louisana Tech University on DECEMBER 8th at the Student Activity Center presented by the LaTech IFC! Main Event Pro Wrestling will see new debuts such as the WAR KINGS! After the announcement of the return of the Crockett Cup in 2019 at #NWA70 they arrive staking their claim as the top tag team in the sport of pro wrestling along with the debut of UWN competitor, Suede Thompson! Reigning Southern Central States Champion Nathan Jolly will defend his title as well as Cruiserweight Champion Bu Ku Dao! Tag Team Champions “Chocolate City” Jonathan Holt & Byron Wilcott will be in the house joined by Cassandra Golden! Also in action Will Allday, Scott Murdoch and so much more! Advance Tickets are only $10! They’re only $5 with your current LaTech, Grambling, or ULM I.D.! All seats are $15 the day of the event.